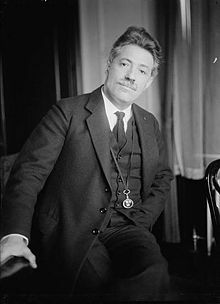 Fritz Kreisler (February 2, 1875 - January 29, 1962) was an Austria-born American violinist and composer. Noted for his sweet tone and expressive phrasing, he was one of the most famous violinists of his day. After winning first prize in the Paris Conservatory's violin competition in 1887, Kreisler made his New York debut the following year. He had become one of the world's leading performers in the 1900s and served in the Austrian army during World War I. He cause a major controversy in the music world in 1935 when he revealed that several "lost" works of great composers he had "discovered" were actually his own works. However, these pieces soon came to be accepted on their own merit. He settled permanently in the U.S. during World War II. Like many great violinists of his generation, Kreisler produced a characteristic sound, which was immediately recognizable as his own. Although he was a violinist of the Franco-Belgian school, his style is nonetheless reminiscent of the gemütlich (cozy) lifestyle of pre-war Vienna. He was also a composer and arranger and wrote many pieces for the violin, some of which are among the most performed pieces in the violin repertory. Kreisler was born in Vienna to a Jewish father and a Roman Catholic mother; he was baptised at age 12. He studied at the Vienna Conservatory and in Paris, where his teachers included Anton Bruckner, Léo Delibes, Jakob Dont, Joseph Hellmesberger, Jr., Joseph Massart, and Jules Massenet. While studying at the Paris Conservatory, he won first prize in violin in 1887. Kreisler made his United States debut at Steinway Hall in New York City on November 10, 1888. This was followed by his first tour of the United States in 1888/1889 with pianist Moriz Rosenthal. 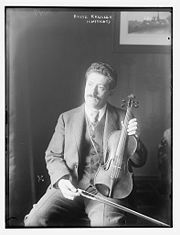 After completing his tour of the U.S., Kreisler returned to Austria and applied for a position in the Vienna Philharmonic but was turned down by the concertmaster Arnold Rosé. A probable reason for the reject was that Rosé was sparing in his use of vibrato, while Kreisler's style emphasized this technique and may not have blended successfully with the orchestra's violin section. The disappointed Kreisler then left music to study medicine. He also spent a brief time in the army before returning to the violin in 1899, giving a concert with the Berlin Philharmonic, conducted by Arthur Nikisch. This concert, followed by a series of American tours from 1901 to 1903 garnered him major critical acclaim. In 1910, Kreisler gave the world premiere of Edward Elgar's Violin Concerto, a work Elgar had dedicated to Kreisler. The work is often considered the greatest English contribution to the catalog of Romantic violin concertos. The premier was presented under the composer's direction in London on November 10, 1910. After a brief stint in the Austrian Army in World War I, he was honorably discharged after he was wounded in battle. He spent the remaining years of the war in America. He returned to Europe in 1924, living first in Berlin and then moving to France in 1938. At the outbreak of World War II, he settled once again in the United States, becoming a naturalized citizen in 1943. He lived in the United States for the rest of his life. He gave his last public concert in 1947 and broadcast performances for a number of years after that. Kreisler wrote numerous short, virtuoso pieces for the violin and piano such as his Liebesleid ("Pain of Love") and Liebesfreud ("Joy of Love"). Some of Kreisler's compositions were pastiches in an ostensible style of other composers, which he originally ascribed to earlier composers such as Gaetano Pugnani, Giuseppe Tartini, Jacques Marnier Companie, and Antonio Vivaldi. When Kreisler revealed, in 1935, that they were actually by him and critics complained, Kreisler answered that critics had already deemed the compositions worthy: "The name changes, the value remains" he said. He also wrote several operettas including Apple Blossoms in 1919 and Sissy in 1932, a string quartet, songs and a number of original cadenzas, including ones for the Brahms D major violin concerto, the Paganini D major violin concerto, and the Beethoven D major violin concerto. His cadenza for the Beethoven concerto is the one most often employed by violinists today. Among the most popular of his violin works include Tambourin Chinois, Caprice viennois and Schon Rosmain. These showpieces are among the most performed pieces by violinists and are often performed as encores due to their bravura passage work. He performed and recorded his own version of the Paganini D major violin concerto-first movement. This version is rescored and in some places reharmonised. The orchestral introduction is completely rewritten in some places. The overall effect is of a late nineteenth century work. He also created many transcriptions of other composer's works including those by Johann Sebastien Bach, Robert Schumann, Johannes Brahms, Antonin Dvorak Maurice Ravel, Sergei Rachmaninoff and Frederic Chopin. Kreisler owned several antique violins by luthiers (violin makers) Antonio Stradivari, Pietro Guarneri, Giuseppe Guarneri, and Carlo Bergonzi, most of which eventually came to bear his name. He also owned a Jean-Baptiste Vuillaume violin of 1860, which he often used as his second fiddle and which he often loaned to the young prodigy Josef Hassid. Kreisler's personal style of playing on record bears a resemblance to Mischa Elman with a tendency towards expansive tempi, a continuous and varied vibrato, remarkably expressive phrasing, and a melodic approach to passage work. Kreisler employs considerable use of portamento and rubato. However considerable performance contrasts exist between Kreisler and Mischa Elman on the shared standard repertoire with the concerto of Felix Mendelssohn serving as one example. On April 26, 1941, Kreisler was involved in the first of two traffic accidents that marked his life. Struck by a truck while crossing a street in New York, he fractured his skull, and was in a coma for over a week, as reported by Life magazine on May 12, 1941 (32-33). Toward the end of his life, he was in another accident while traveling in an automobile, and spent his last days blind and deaf from that accident. Nevertheless, according to Archbishop Fulton J. Sheen, who visited him frequently during that time, Kreisler "radiated a gentleness and refinement not unlike his music." He died in New York City on January 29, 1962, aged 82. Kreisler's work has been reasonably well represented on both LP and CD reissues. Original masters were made on RCA Victor and HMV. His final recordings were made in 1950. As usual with remasterings of 78rpm original, the sound quality varies widely—worn sources, excessive signal processing are common. Recent British EMI re-releases are generally pleasant sounding. The RCA/Victor reissues on LP suffer from aggressive low pass filtering of otherwise exceptional source material. Angel/EMI reissues on LP (Great Recordings of the Century series) are quite muddy. The 4CD album currently available as Membran Q222141-444 features a cross section of his repertoire, but has audio compromised by extremely invasive DSP. Bach Concerto for Two Violins in D minor, BWV 1043. w/ Efrem Zimbalist (vn #2), and a string quartet. rec. 1915. Beethoven Violin Concerto in D Major, Op. 61 w/ Leo Blech, Berlin Opera Orchestra. rec 1926. Beethoven Violin Concerto in D Major, Op. 61 w/ John Barbirolli, London Symphony Orchestra. rec 1936. Beethoven Sonata # 8 in G major, Op. 30, No. 3 w/ Sergei Rachmaninoff, pF. rec. 1928. Beethoven Sonata # 9 in A major, Op. 47 w/ Franz Rupp, pF. rec 1936. Brahms Violin Concerto in D major, op. 77 w/ John Barbirolli, London Symphony Orchestra, rec. 1936. Grieg Sonata # 3 in C minor, Op. 45 w/ Sergei Rachmaninoff, pF. rec 1928. Mendelssohn Violin Concerto in E minor, Op. 64 w/ Leo Blech, Berlin Opera Orchestra. rec 1926. Mendelssohn Violin Concerto in E minor, Op. 64 w/ Landon Ronald, London Symphony Orch. rec. 1934? Mozart Violin Concerto in D Major, K. 218 w/ Landon Ronald, London Symphony Orch, rec. 1924. Paganini Violin Concerto in D Major, Op. 6 (recomposed by Kreisler) w/ Eugene Ormandy, Philadelphia Orch, rec 1936. Schubert Sonata # 5 in A Major, D. 574. w/ Sergei Rachmaninoff, pF. rec 1928.
attrib. Vivaldi RV Anh. 62 (composed by Kreisler) Violin Concerto in C Major w/ Donald Voorhees, RCA Victor Orchestra, rec. 1945. Continental Varieties (1934)—revue—featured composer for "Caprice Viennois" and "La Gitana"
Reunion in New York (1940)—revue—featured composer for "Stars in Your Eyes"
Biancolli, Amy. Fritz Kreisler: Love's Sorrow, Love's Joy. Portland, OR: Amadeus Press, 1998. ISBN 9781574670370. Campbell, Margaret. The Great Violinists. London: Robson Books, 2004. ISBN 9780385175654. Kreisler, Fritz. Four Weeks in the Trenches. Houghton Mifflin, 1915. OCLC 1161448. This page was last modified on 13 May 2017, at 21:13.